Here we present our associated tour operators which can realize your wildest travelling dreams. Our aim is to inspire and assist experienced backpackers and adventurers with their plans to explore interesting and exciting places around the world. We combine traditional travel experience and web knowledge, giving you an unique combination of travel expertise and innovative attitude in online travel. Tour operators on this page are carefully selected based on thoroughly information. They are highly professional and look forward to take you on a great adventure trip that you never forget. If you want to book or need more information about the tours, send an e-mail or call the tour operators directly. Are you ready for an extraordinary adventure? Get face-to-face with the wildest wild life in the middle of African savannahs. The Eriksen Adventure (website: www.theeriksenadventure.com) offers a wide variety of tour opportunities in East African countries as Kenya, Uganda and Tanzania. For travellers with genuine adventurous spirit, the wildbeast migration between Masai Mara and Serengeti is really something to experience. The ecosystem here is considered as one of our planet's greatest wildernesses. The migration is an endless pilgrimage, with no beginning or no end, where animals continuously search for food and water. Another opportunity for unique adventures is the Ngorongoro Conservation area, which is home to the famous volcanic Ngorongoro crater. It`s located near Arusha in Tanzania. This enormous crater is the largest unbroken caldera in the world, and notified as a World Heritage site by UNESCO. A population of about 25,000 large animals, largely ungulates along with the highest density of mammalian predators in Africa, lives in the crater. Maasai herders graze their cattle amid the wildlife here, which roams freely. If the wildebeest migration of the Masai Mara and Serengeti, and wild life in Ngorongoro Conservation area is not enough, the Eriksen Adventure offers travellers to combine it with climbing Africa’s highest peaks Mt. Kilimanjaro in Tanzania and Mt. Kenya in Kenya. Photo. Wildbeasts on their way to Masai Mara, also called the Eight Wonder of the World. East Africa has also a fascinating tribal people with timeless cultures unchanged by the modern world. 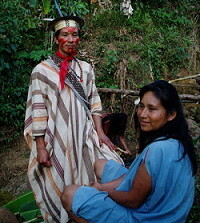 Many of them have retained their ancient traditions and crafts. The nomadic pastoral tribes are amongst the most colourful in East Africa. The Eriksen Adventure offer tours to meet exotic tribes as Luo, the Abagusii, and the Kuria people near Lake Victoria. Other tribes travellers can visit are the Abaluhyia people, who organise bull fighting, and the Isikuti people who are renowned for their spectacular traditional dances. Photo. Tribe people in Kenya displaying their traditional dance. The staff and guides in The Eriksen Adventure have lived and worked in Africa for years, taking travellers from around the world on adventurous safaris. Each day spent in East Africa, brings new dramatic sights, sounds and experiences where days never are the same! We in Travel Explorations don't take any responsibility for tours, products or services not delivered or wrongly delivered by the advertisers. Be aware that we don't take any responsibility for any accidents or unpleasant incidents that can happen on journeys inspired by us. All travelling is based on travellers own risk.